The clash of two cultures was evident, as our kayak group sat in our boats staring at the 20 or so sea nomads sitting in their “mother boat”. The sea around us was dead calm, our boats barely moving in the windless and waveless waters. The expressions of the Moken people was stoic, as we waved and smiled at them, trying to elicit some sort of response. But they seemed uninterested in our kayaks, our gear, or our smiles. As the rest of our kayak group soon started paddling on, giving these people their silence back, I made one last attempt to get some sort of response out of them. I rolled my kayak. Expecting clapping and laughter as I immerged, there was no change in their stoic expressions. I waved one last time, and paddled off in the direction of the others. As I paddled towards our “mother ship”, I was once again taken aback at where I was. 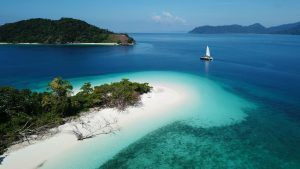 We were in Myanmar,kayaking and sailing our way through the Mergui Archipelago. We were on an exploratory trip to find the best places to kayak amoungst these beautiful Islands. What we had found to date was nothing short of amazing. The diversity of the paddling in the archipelago was quite surprising. 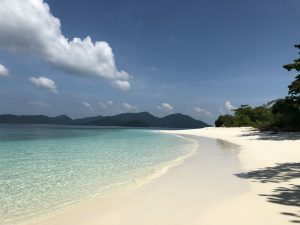 The first few days of the trip saw us paddling through many low lying islands with perfect white sand beaches framed by the greenest, densest jungle I have ever seen. Our anchorages each night in front of tropical beaches gave us ample opportunity to swim and snorkel during the mornings and evenings. 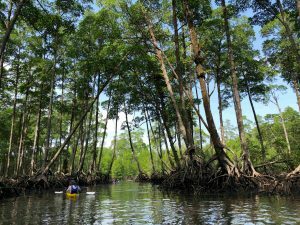 We spent a few kayak outtings exploring incredibly extensive mangrove forest. With no crocodiles in the archipelago, we felt liberated in these mangroves as we could explore narrow passageways for kilometers on end. One particular passageway brought us to a stand of mangrove trees at least 40 meters high, with the roots extending way beyond our reach. I felt like I was in the equivalent of an old growth forest. As if we were in a parallel universe to the redwoods in California or the giant cedar trees of British Columbia. On one particular beach stop, we encountered a middle aged Moken man, and we ended up trying to paddle his Kabang boat. The kabang boat is a one person, small boat that they row standing up. Those of us who tried rowing the boat, looked awkward and were very close to tipping the boat. The boats were designed to show that the Moken people had nothing to steal. I recalled all of the things I had recently learnt about the Moken People. For centuries they lived on their “Mother boats” with their extended families, dived and collected for their sustenance, and resisted all forms of technology. Their ideology is based on non-accumulation of goods and wealth. They forbid assimilation into dominant society by refusing written language and education. Because of their deep knowledge of nature, and powerful folklore stories, they were able to predict and avoid the Tsunami of 2004 that devastated the Andaman Sea. As we continued southward in the archipelago, the landscape started to take on a dramatic change. We sailed towards three long, thin islands with some of the most rugged coastline I have ever seen. 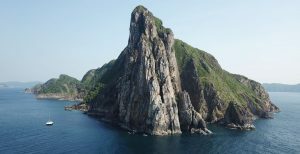 Dramatic granite cliffs rising straight out of the ocean for 300 meters greeted us as our expert captain found a safe anchorage in the shadow of the first island. As a group of sea kayakers, we began to get really excited. We could see indents in the cliff faces, indicative of cave entrances. 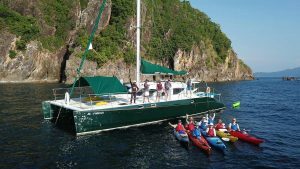 We quickly donned our rash guards, sun hats, sunglasses and sunscreen and clamoured into our single and double full-length sea kayaks. The next few hours were some of the best sea kayaking I have ever experienced. Cave after cave presented itself as we paddled along the base of the cliffs. A few of these “caves” became tunnels where we could enter through one opening and exit through another a short distance away. Some caves were long tunnels that ended in complete darkness. We paddled through numerous massive arches that left us feeling dwarfed and insignificant amongst these dramatic island landscapes. We had three days worth of outings like this, and we were all like kids in a candy store on every outing. Our trip was soon coming to a close, with only two more days in the archipelago, we felt as though the trip couldn’t get any better. But our final two days presented the most astounding sights to date. The most southern region of this archipelago is compromised of limestone islands. Old coral reefs that have, over time, become limestone islands, and eroded away into amazing limestone formations. As we paddled around one limestone Island, there was a low entrance at the base of the limestone, we went closer to investigate. 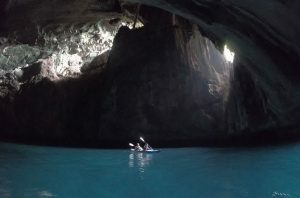 We ended up paddling underneath a wall of limestone, ducking our heads to prevent collisions with stalactites. We paddled into a hidden lagoon! The waters were the most aqua blue green imaginable, with sea eagles soaring overhead, and limestone all around us. We explored the lagoon that was open to the sky above, and just sat for many minutes in our kayaks, marvelling at this natural wonder. A delicacy called “Bird Nest Soup” exists in Asia. A particular cave dwelling Swiflet, a small bird that lives in caves, creates a delicate nest that is the base of bird’s nest soup. The swiftlet uses its saliva to create a delicate, white nest that looks like hardened vermicelli noodles. Bird nest collectors scale rope and bamboo poles for hundreds of vertical feet to collect the nests. Once processed, a kilogram of these nests can be sold for anywhere between $2000-$4000 depending on the year. waiting. We lifted anchor and enjoyed our last Thai cooked meal on the boat. We spent the last few hours under sail and lazily hang out on the front trampolines as we reminisced about the days spent exploring these amazing islands and culture. 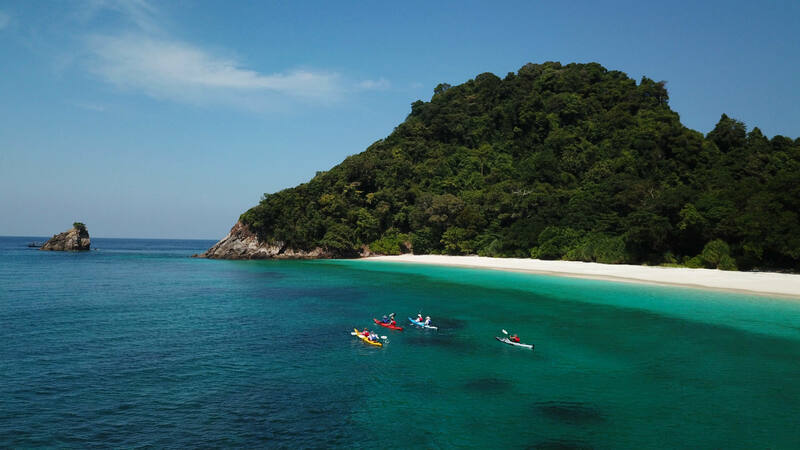 Myanmar’s Mergui Archipelago, with more than 800 limestone and granite islands, is a kayaking paradise. The islands are cloaked with tropical rainforest. The shoreline is punctuated by gorgeous sandy beaches, rocky headlands, fringing reefs and mangrove forests. Each island is different, providing variety and interest to each kayaking outing. Previous Previous post: A Picture is Worth a Thousand . . .